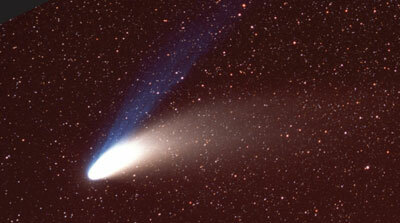 File photo of Comet Hale-Bopp which wowed observers in 1997. Image: Kazuhiro Seto. A new comet has been discovered that is predicted to blaze incredibly brilliantly in the skies during late 2013. With a perihelion passage of less than two million kilometres from the Sun on 28 November 2013, current predictions are of an object that will dazzle the eye at up to magnitude —16. That's far brighter than the full Moon. If predictions hold true then C/2012 S1 will certainly be one of the greatest comets in human history, far outshining the memorable Comet Hale-Bopp of 1997 and very likely to outdo the long-awaited Comet Pan-STARRS (C/2011 L4) which is set to stun in March 2013. The new comet, named C/2012 S1 (ISON) was found by the International Scientific Optical Network (ISON) in Russia on 21 September when astronomers Vitali Nevski and Artyom Novichonok captured it on CCD images taken through a 0.4-metre reflector. Its near-parabolic orbit suggests that it has arrived fresh from the Oort Cloud, a vast zone of icy objects orbiting the Sun, pristine remnants of the formation of the Solar System. C/2012 S1 currently resides in the northwestern corner of Cancer. At magnitude +18 it is too dim to be seen visually but it will be within the reach of experienced amateur astronomers with CCD equipment in the coming months as it brightens. It is expected to reach binocular visibility by late summer 2013 and a naked eye object in early November of that year. Northern hemisphere observers are highly favoured. Following its peak brightness in late November it will remain visible without optical aid until mid-January 2014. Comet brightness predictions sometimes exceed their performance. Amateur astronomers of a certain age may remember the Comet Kohoutek hype of 1973 – not quite the 'damp squib' it has been portrayed, since it reached naked eye visibility! Even if C/2012 S1 takes on the same light curve as Kohoutek it is certain to be spectacular, quite possibly a once-in-a-civilisation's-lifetime event.